Even though it is popular to use a network attached storage sometimes it is nice to have storage closer to the computer, for example for Timemachine backup on a Mac or just as a way to add more storage space on a laptop with a small SSD. The Startech enclosure we are reviewing today, the StarTech Thunderbolt Dual SSD Enclosure S252SMTB3, comes with a Thunderbolt interface that not only lets you daisy-chain it with several other peripherals but also offers a lot of bandwidth making it a perfect option for increasing the storage space on a Mac Book Air or other computer with little initial storage. After testing it turns out that it performs just as well as expected with just a few minor complaints. Read on to find out more. Since this merely is a drive enclosure there are not any special features to speak of. There’s room for two 2.5″-drives with a max height of 15 mm and a small fan can keep them cool if needed. Two Thunderbolt connectors handle the connection to the computer and any other peripheral you want to hook up. Thunderbolt is an interface that offers a lot. It combines PCI Express (PCIe) and DisplayPort (DP) into one serial signal alongside a DC connection for electric power and you can daisy chain up to 6 peripherals including displays and storage enclosures. So far the interface however is pretty rare in PC laptops and computer though and the few motherboards from Gigabyte and ASUS that offers Thunderbolt cost an arm and a leg. Most laptops today come with a mini-DisplayPort which is the same form factor as a Thunderbolt connector but only carries the display signal. The one computer maker that has invested heavily into Thunderbolt is Apple. We’ve seen before with FireWire that Apple does not have a problem going their own way and right now all their computer-products come with a proper Thunderbolt or Thunderbolt 2 (the newer version with up to 20 Gbps of bandwidth). 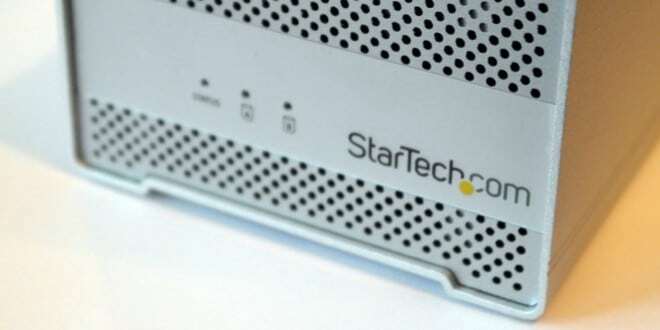 The StarTech Thunderbolt Dual SSD Enclosure is a great little Thunderbolt-enclosure that not only can daisy-chain other devices but also offers great performance for your SSD-drives regardless if you use RAID0 or RAID1. How this is “Great performance” when those SSDs should go up to 1,2 GB/s in raid 0? Even internal MBA m.2 SSD is getting up to 738MB/s reads. This product looks like “half-way” developed, bacplane, poor fan mounting solution… 225$ ?! For what, 20$ Thunderbolt chip ?? !